You may need this cat in your home! 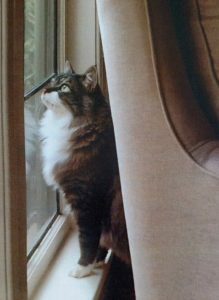 Miss Kitty is a rescue Norwegian Forest Cat mix who bonds mightily with her person. I have found her to be warm, with lots of fur. She is very affectionate and likes to play in the early am. After the play comes the feeding (early am), at which time I clean her box. She has perfect litter box habits and is healthy and spayed. She is sensitive to loud and deep voices. Unfortunately, I have become unable to provide her care for much longer and need to find a new forever home for her. Stats: Miss Kitty is between 10 & 11 years old; weighs 10 pounds. Contact Margaret, 503-288-6523.